The Fates Will Find Their Way by Hannah Pittard, Ecco/HarperCollins Publishers, 2011, 246 pp. This is the last book from my impulse buys at the YMCA book sale a few months ago. They weren’t a half-bad lot, in all. This was a good vacation read during Christmas break–quick, light, but also a bit forgettable. And, frankly, there were some scenes I would rather forget. 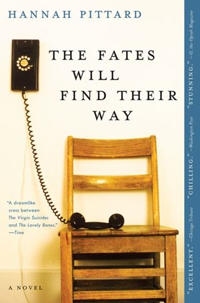 The Fates Will Find Their Way is the story of a group of teen boys and their reactions–over the course of their lives–to a classmate, Nora Lindell, who goes missing. The story is not quite a mystery, although there is an element of mystery in it. It is not quite a coming-of-age novel, although we watch the boys mature into adulthood. Pittard uses a unique narrative voice, a “we” that consists of the group as a whole, that speaks not for one particular boy, but for the whole group and their shared memories and shared fantasies. That voice lasts throughout the entire narrative, as the group ages and the dreams and imaginations change. The story then carries a murkiness from beginning to end, as the group creates fantasy narratives for Nora’s life, both juvenile and adult, both terrifying and beautiful. The story felt slow at first, as it took awhile for me to adapt to the strange narrative voice or to develop a relationship with the characters, since there were so many sharing the spotlight equally. There was also a lot of sexual content in the teen years, both fantasy and reality. I don’t consider myself a prude, but I found it a little more graphic than was helpful or interesting to the story. The Fates Will Find Their Way was a fine vacation read, an interesting narrative device, but nothing too exciting. 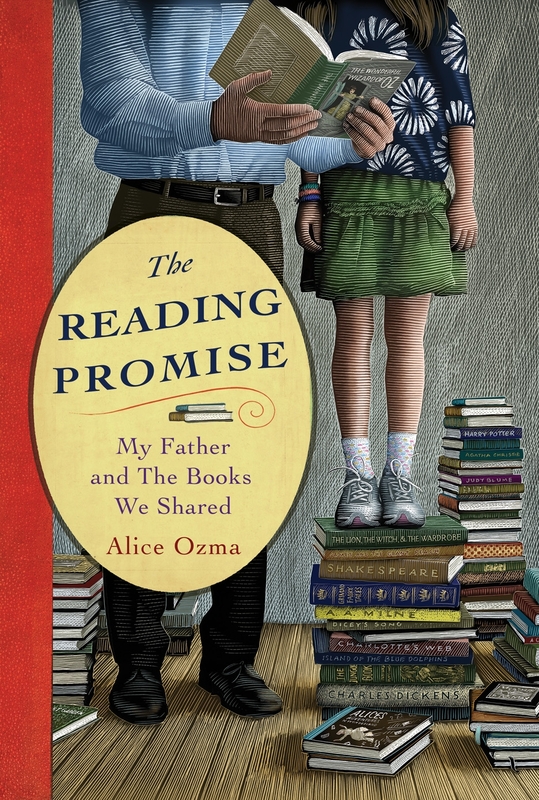 The Reading Promise: My Father and the Books We Shared by Alice Ozma, Grand Central Publishing, 2011, 288 pp. I heard about this book after an interview with the author on NPR. I am parent and a certified book nerd (c’mon, not only do I read like crazy, collect books like personal friends, but I blog about what I read here), so I found it impossible to resist a book about sharing a love of books across generations. Alice Ozma and her father began what became known as “The Streak” when she was in the fourth grade. They made a commitment to read together every night for 100 consecutive nights. To true readers, 100 nights is far too short–as it was for Alice and her father. The Streak continued for the next eight years, until Ozma left for college. The Reading Promise is not just the story of the books they read, but of their relationship over those years. Alice’s father was a single parent and eccentric elementary school librarian. He and Alice had a particular and sometimes peculiar life together, full of imagination and affection, but not without hardship. It is a touching memoir, full of humorous and touching stories of Alice and her father over the years of The Streak, including the sometimes extraordinary measures they would take to continue it. I had expected the book to be like an extended book report, a catalog of how art imitates and informs life. I had hoped for advice about how to inculcate a love of reading in my child. I coveted a list of all the books they read, and how they managed to sustain a practice of reading aloud for so long. Those things were there, but they were implicit rather than explicit. She didn’t write about how the books impacted her life, but about how the books became the foundation of her relationship with her father, even through the difficult years of adolescence. And yes, there was also a list of all the books they could remember reading together–which was my favorite part of the book. I recommend The Reading Promise to anyone wondering why and how reading with your child makes a difference, or looking for inspiration for the work of reading together every night for a sustained time. Alice Ozma is only in her early 20’s, which is young to have produced a memoir. I wonder if there will be more forthcoming books from her. 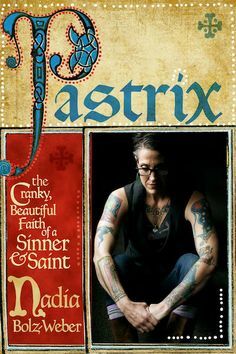 Pastrix: The Cranky, Beautiful Faith of a Sinner and Saint by Nadia Bolz-Weber, Jericho Books, 2013, 206 pp. I have been reading Nadia Bolz-Weber’s blog at Sarcastic Lutheran for several years, and I have appreciated the depth, honesty, and fresh insight of her sermons. I first heard about the forthcoming book there many months ago, and I have been amazed to see her celebrity develop since the book’s release. She was already a popular figure in some Christian circles, but her voice is reaching much more broadly now. Just yesterday on Christmas Eve, NPR’s Morning Edition did a feature story on her. Before I talk about the book itself, I want to disclose my reaction to the hype about the book. In watching her blog change and transform before the book release, and then watching her move from a struggling new church start pastor into a celebrity preacher, I have watched her persona become her brand, her story become her marketing pitch, and her scrawny struggling church become the hippest place to be. This move into a polished, packaged Nadia–not fake, just an image carefully cultivated–made me skeptical about the book. The media seem captivated by her swearing and her tattoos, which I don’t find particularly scandalous or even interesting. (Not-so-secret pastor insight: most pastors I know swear like sailors, just not around the church. It’s a pretty harmless vice.) What made her voice so powerful was its earnest wrestling with grace. Would the book contain the raw struggle I so appreciated, or would it have been packaged and marketed and honed so carefully that the rawness was gone? Pastrix did not disappoint. While it did feel more edited and worked-over that her older writings, any book with a decent editor should be that way. While I guess the swearing and stories about her pre-recovery life make the book edgy to some, the theology she espouses is traditional and orthodox, without being stuffy and pretentious. She speaks like many Christian converts I have met over the years–like someone whose life has been saved by a relationship with Jesus Christ. She wants others who are desperate and hurting to know the grace that now rules her life. Her experience, her intellect, her humor and her faith combine for a powerful take on the old-fashioned good news of the Gospel. Pastrix didn’t offer me any particularly new information or revelation, although the grace and inclusiveness she preaches may be new to some. Instead, it was like listening to any exceptional preacher. Nadia Bolz-Weber’s words remind me of what I already know about God, church, grace and faith—but she says it so well, so powerfully that becomes new and moving all over again. I enjoyed this book for the same reason I have enjoyed her blog: she preaches to me in ways that move and inspire and make the Gospel real. That sounds just like something I often say to new members at my church–only she says it much more beautifully than I do, and that keeps me coming back to hear her voice again. I recommend Pastrix not because it’s edgy or cool, or because she’s a pastor who swears and wears tattoos, but because it’s just good preaching, good words, and it will lift your spirits. 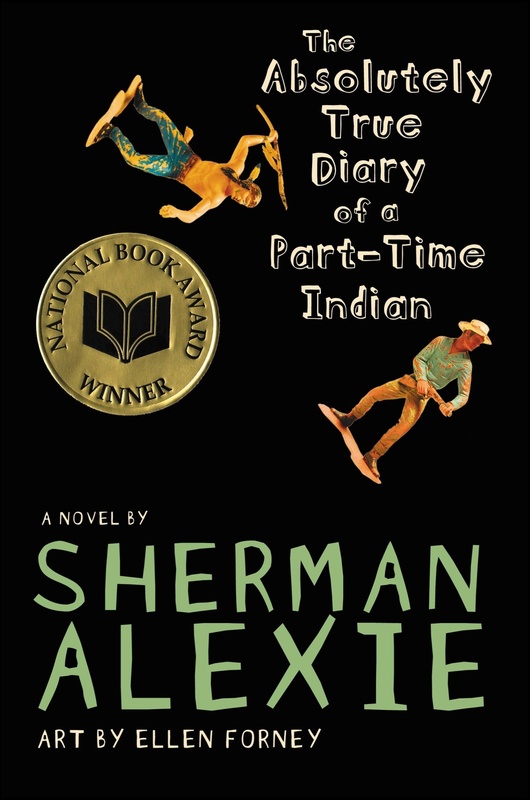 The Absolutely True Diary of a Part-Time Indian by Sherman Alexie, Little Brown & Co., 2007, 230 pp. I kept hearing reports and conversations about this book. Many loved it, a few didn’t, each had elements they shared for critique or praise. Everyone said it was an important contribution to young adult literature, because Sherman Alexie brings a new perspective, often lauded as the first modern Native American voice in young adult fiction. So I decided to see for myself. After Harry Potter and The Hunger Games, I’m developing a much greater openness to young adult fiction. Alexie’s book is the story of Arnold Spirit, who usually goes by “Junior,” growing up on a reservation in Washington. Junior was born with water on the brain, but grows up smart and top of his class. On top of the normal challenges of middle school, he deals with bullying, poverty, alcoholic family members, drunk driving, and violence. He copes by drawing cartoons, which appear throughout the book. His intellect give him the opportunity to transfer out of the reservation school and into the rich, white high school. In spite of unreliable transportation and harassment from both sets of schoolmates, Junior perseveres at the white high school, even making the basketball team. Alexie gives Junior a strong voice, that sounds just like you’d expect a high school boy to sound. I did think from time to time that the story became too much, and wondered how so many bad things could happen to the same kid. But Alexie claims to have based the novel on his own experiences, so I trust it comes from an authentic place. The novel does open up a view into the situation of poverty and addiction that is all too common on the reservation, but I didn’t find it especially insightful. Perhaps that’s because I am already familiar with many of those issues, or because I am not the target audience of young adults. I am grateful that the world of young adult literature is expanding to include new and different voices. Junior’s story was honest, encouraging and inspiring. I would definitely recommend it to middle and high schoolers in my life. Jhumpa Lahiri’s The Namesake was one of the best, most memorable books I had read in a long time. 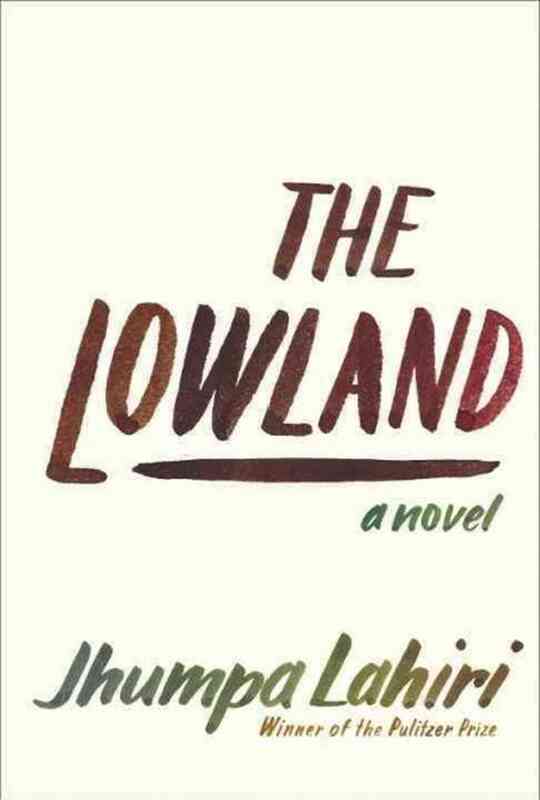 I couldn’t wait for the chance to read her next novel, and The Lowland did not disappoint. The novel follows the life of Subhash Mitra. It starts when he was a boy, growing up with his brother Udayan. Udayan is always the more adventurous, risk-taking brother. He goads Subhash into break rules, especially impatient with the strictures of class, caste and colonialism. As they grow up, they both seek out careers in science. Subhash moves to the United States for graduate school, just as Udayan becomes involved in a 1960’s radical movement whose suppression ends in tragedy. Subhash spends the rest of his life trying to make up for his brother’s loss, taking care of things in his brother’s place. Every relationship that belonged to his brother then belongs to him–their parents, Udayan’s girlfriend and more. The Lowland unfolds the story of Subhash and his relationships across the decades of his life. I hesitate to say more because I don’t want to give the story away. It’s beautifully written prose, an intricately woven story, fascinating characters and compelling narrative. The first section, when Subhash and Udayan were boys, felt a little bit slow, but it’s worth reading on until they grow up. I’m already looking forward to Lahiri’s next book, and hope she has a long and fruitful career ahead. 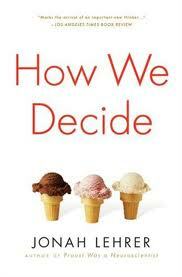 How We Decide by Jonah Lehrer, Mariner Books, Houghton Mifflin Harcourt, 2009, 302 pp. I read this on an airplane, and it was great non-fiction airplane material. Not too light to fly through, not so heavy it required silence to concentrate. It was another impulse buy at the YMCA used book sale. How We Decide is mostly pop science and pop psychology, with a hint of business and self-improvement thrown in. Lehrer examines the latest neuroscience studies about what parts of the brain are active in decision-making, and the difference between acting based on feelings or on rational thought. He also carefully examines which kinds of decisions are most successful when made with one part of the brain or the other, or both. Lehrer’s book bears a resemblance to Malcolm Gladwell’s Blink, and even cites some of the same neuroscience studies. However, he pursues a different question. Gladwell tracks the value of snap judgments. Lehrer looks at both gut reactions and careful analytic decisions, and the differences between them. Lehrer takes apart the classic distinction between decisions based on emotion and those based on reason. The West has always privileged reason over emotion. However, modern research has proven that all decisions require some element of both. We cannot make decisions–even simple ones–if the emotional part of our brain is shut down. Lehrer writes, “Our emotions are deeply empirical.” Dopamine neurons teach our brain to respond based on past experiences–they program our emotional reactions based on all our prior decisions and their effects, right or wrong, which means that sometimes our emotions know better than our minds. Although Lehrer does not explore this territory, I could not help but imagine all the ways this same brain research explains the deep patterns formed by our childhood experiences. Our family life in the early years sets up patterns and expectations that forever mark our emotional reactions to the world. However, emotional decisions are not always the best ones. Lehrer explores those decisions that are best made from emotional responses, those best made from reason, and those best made by a combination of the two. He explores loss aversion (bad is stronger than good, a loss hurts worse than a gain feels good), executive control (the ability to analyze your emotions and impulses), overthinking (analyzing too much can lead to a poor decision), and morality (altruism, generosity and kindness). He has a range of examples from quarterbacks in the pocket to soap opera casting directors to gamblers to military members watching radar for missile attacks. In the end, he concludes that the brain functions best as an argument–that emotion and reason must contest with one another, and it is the contest that yields the best decisions. The book was fascinating, and I can imagine using many of the neuroscience studies and their insights–as well as Lehrer’s examples–as sermon illustrations for a variety of scriptures. 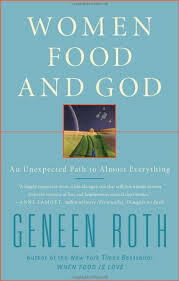 Women, Food and God: An Unexpected Path to Almost Everything by Geneen Roth, Scribner, 2010, 211 pp. I don’t even know how to start talking about this book. Geneen Roth is the non-diet expert, who speaks to women of their food issues by telling us it is about issues first and food second. This book is the summary of all of her other works, the one that puts her philosophy and worldview together in one place. As always, it just makes sense to me, even if I am not ready or able to change my life to conform to it entirely. The basic premise of the book is that women who struggle with their relationship with food are using food to deal with their emotions, either by exercising control through denial or indulgence through regular binges. I find this to be true to my experience–I eat to celebrate, eat to grieve, eat to decompress, eat to be happy, eat to be sad. My relationship with food has far more to do with my emotional life than my body or my belly. The central part of Roth’s philosophy is summarized in her guidelines for eating. Simple, whole, and reasonable–yet still a challenge for those who struggle against emotional eating. The guidelines include eating when you are hungry, stopping when you are full, sitting in a calm environment, being free from distractions, eating what your body wants, and eating with “enjoyment, gusto and pleasure.” Finally, eat (with the intention of being) in full view of others. Even if change is slow, I try to be mindful of these guidelines and take small steps as I am able. Roth’s books have been a help to me, and this one has too.